The Second Annual BLEND: The World's Best Wine, Food & Places - billed as "the only event that showcases Washington's hottest blends" - brought together more than 40 top Washington State wine producers at Bell Harbor International Conference Center in September. Guests enjoyed sampling and celebrating many of the state's best wine blends, paired with delectable cuisine from Columbia Hospitality's fabulous hotels and resorts, including Salish Lodge & Spa, the Inn at Langley, Cave B Inn & Spa and Kenwood Inn and Spa, all on the spectacular Seattle waterfront. Bell Harbor International Conference Center was chosen as one of six conference centers in the western U.S. to receive a Successful Meetings Pinnacle Award in 2011. The awards are chosen by the publication's audience of meeting professionals. 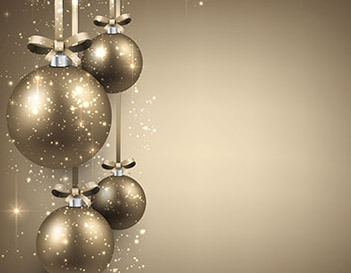 A complete list of winners can be found here. Attendees at last night's Guest Chef on the Waterfront, FareStart's annual benefit, thronged tasting booths featuring pork-belly banh mis from Skillet and tortelli from Cantinetta. But the event's big winners came from kitchens rarely mentioned in local culinary circles. The best entrée prize was awarded to the Washington State Convention & Trade Center for chef Jose Chavez's halibut ceviche with mango and avocado. Chavez's dish garnered the most points from a panel of 10 judges (including me and fellow Voracious contributors Jay Friedman and Julien Perry), earning it "Best Overall Dish" honors. Chef Jay Bartleson of the Bell Harbor International Convention Center picked up his second Guest Chef prize in three years, winning the appetizer division with his cold-smoked monkfish served over an arepa made with roasted Yakima corn, flour, roasted garlic, and chives and topped with horseradish cream cheese. A leaf of wild baby arugula, a drizzle of lemon crème fraiche, and a dash of tobiko completed the very pretty presentation. Bartleson's dish was my favorite bite of the evening. The sweet monkfish had a fresh, outdoorsy smoke, and the roe provided a swingy saltiness. Last night's event marked the appetizer's debut, but Bartleson anticipates adding it to his regular catering menu. His scallops entry from 2009 and salmon bake from 2011--"We didn't win with it, but we should have," he says--have both become Bell Harbor mainstays. Experimenting, Bartleson says, "is the great thing about doing the event." Bartleson concedes he has a home-court advantage, since the event is conducted on his property. But judges base their decisions on a blind tasting, and Bartleson swears his staff wouldn't sabotage their competitors by withholding equipment or hoarding storage space. "When [other restaurants] come in, we give them a hand," he says. Major catering facilities tend to do better in tasting competitions because their chefs aren't ruffled by the prospect of feeding thousands of people, Bartleson theorizes. Experienced caterers know eaters floating between tasting tables don't want to mess with sticky, sloppy dishes or anything that requires a knife. "We prepared 1200 appetizers for Guest Chef," Bartleson says. "That's a standard day for us. We do Microsoft events with 6,000 people. That's just a ridiculous amount of food production." Bartleson's crew is now readying for a Nordstrom event next week that will require 8,000 appetizers. Events such as Guest Chef represent one of the kitchen's few opportunities to feed Seattleites who aren't corporate employees or wedding guests. "It's nice for guests to see what we can do," Bartleson says. "Creating satisfied customers is not what we want to do," says Shelley Tomberg, vice president of sales for Bell Harbor. "We want to create 'screaming evangelists.' fans and customers for life." The conference center can count Bill Gates in that group. When Microsoft hosted a conference at Bell Harbor during Seafair weekend, an unidentified backpack forced the evacuation of the entire venue. 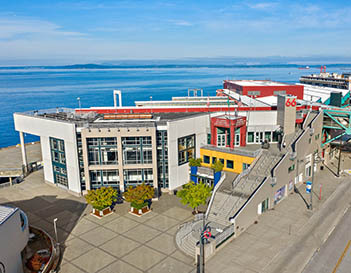 Bell Harbor's team gained permission to relocate the conference to an aircraft carrier docked alongside their building at Pier 66 as a temporary venue. In less than an hour, the entire 250-person conference was moved, and Gates delivered his address onboard with an American flag backdrop. Bell Harbor offers 100,000 square feet of space and complimentary high-speed Internet access with bandwidth for hundreds of heavy users. Salish Lodge & Spa and Bell Harbor International Conference Center participated in the Greening Washington's Lodging Industry pilot program. Spearheaded by the Washington Lodging Association (WLA) and Cascadia Consulting Group Inc. (Cascadia), results of the program are intended to provide a roadmap to industry peers and the public for adopting positive environmental practices throughout Washington State. SEATTLE - Two Columbia Hospitality managed properties, the Salish Lodge & Spa and Bell Harbor International Conference Center, recently participated in a pilot program to green their operations. The properties were part of the Greening Washington's Lodging Industry pilot. 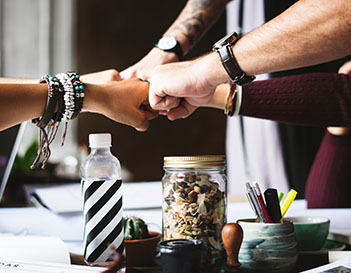 Led by the Washington Lodging Association and Cascadia Consulting Group, results are intended to help peers, guests and the public adopt environmental practices. The program was funded by a $53,000 grant from the Washington State Department of Ecology in 2009. As part of the program, Salish saved $6,100 and 75,000 kilowatt hours in a year from switching to energy efficient LED and fluorescent lighting. It also saved $450 per month in waste costs from an increased recycling program and developed a Salish Green Team to discuss new opportunities. Bell Harbor saved $15,000 from June to December of 2010 by offering water stations to guests rather than bottled water, eliminating waste from 40,000 bottles. It recycled 70 percent of its total waste, diverting 65 tons of organic material from landfills to food donations and composting since March. Lenny Zilz, vice president of operations for Columbia Hospitality, said it has been exciting to participate. "Not only have we made large strides in our own greening practices and procedures across the board, but we are thrilled to be in a position to share our findings with our industry peers to promote continued environmental awareness and stewardship." If you are planning a destination wedding in Seattle, then you are in for a treat. You could get married in a historic hotel or bed and breakfast. You could party your special night away in a location near the waterfront while your guests enjoy a spectacular view and a night they won't forget. Many of the locations for ceremonies and sites listed have wedding planners, caterers, florists, and photographers they work with and can recommend to you. You can also have your ceremony and reception at the same place in Seattle. If you choose to have them at different spots, don't forget about transportation. Places for the ceremony: Finally, you could opt for a waterfront venue located at Pier 66 with the Bell Harbor International Conference Center. An important Pacific port and industrial center, Seattle is Washington's largest city, with a population of 600,000. The picturesque metropolis, landscaped with towering skyscrapers, lies on a narrow strip of land between Puget Sound and the Olympic Mountains to the west, and Lake Washington and the Cascade Mountains to the east. Consistently among to the top 10 in Travel and Leisure's annual Favorite American Cities list, Seattle is also a draw for meeting planners seeking the perfect mix or urban attractions (museums, shopping, dining, and nightlife) and outdoor recreation (hiking, mountain climbing, boating, sailing and skiing). 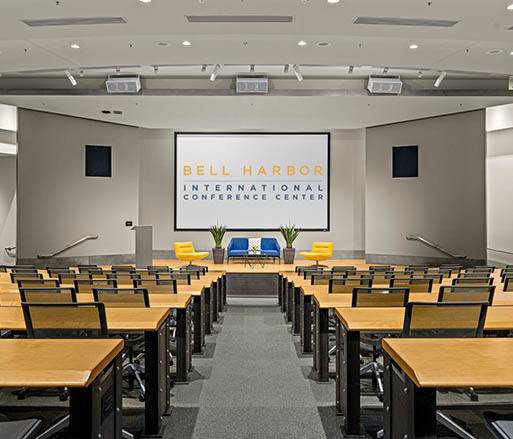 Another option for meetings is the Bell Harbor International Conference Center (bellharbor.com), a waterfront venue with 18 meeting rooms and more than 100,000 sq. ft. of space that can accommodate up to 5,000 guests. For a classic waterfront meeting, with panoramic views of the Olympic Mountains, Mt. Rainier and Puget Sound, the Bell Harbor International Conference Center (bellharbor.com) offers 100,000 sq. ft. of meeting space and 18 meeting rooms. Ideal for the tech set, the center features state-of-the-art A/V, webcasting and videoconferencing, high-speed Internet, touch-screen control systems and an on-site technology team. Seattle's waterfront location provides the city with gorgeous views, scenic ferry rides, incredible wildlife, and best of all, fresh seafood. Nine of the city's waterfront restaurants competed today in a competition of endurance and talent to see who could master the chicken soup of the sea - clam chowder. The 14th Annual Chowder Cook-Off Competition was hosted by the Edgewater Hotel at their restaurant, Six Seven. The panel of judges was made up of "local celebrities", including "Downtown Joe" of radio station KZOK. The Chowder Cook-Off Competition kicks off the Seattle Maritime Festival, which runs May 6th through May 8th. Along the waterfront there will be family friendly activities including tugboat races, a boat building competition and more. The Bell Harbor International Conference Center, given Gold Tier status last year by the International Association of Conference Centers for its commitment to sustainability, has recently completed a one-year survey of its carbon footprint, and drawn up guidelines for reducing it even further. Among the suggestions for events held at the center are to provide water stations rather than bottled water, using whiteboards instead of flip-charts, limiting use of notepads, reusing nametags, providing electronic media rather than printed materials and encouraging carpooling among attendees. In addition, all flatware, dishes, napkins and cups are reusable, and the center uses fair-trade coffee and locally grown produce whenever possible. Leftover food is donated to local food banks, waste is composted and kitchen grease is recycled into biofuel for the Port of Seattle's vehicle fleet. Bell Harbor sits on Pier 66 in downtown Seattle, and is managed by Columbia Hospitality. It boasts 18 meeting rooms totaling 100,000 square feet of space and it can hold up to 6,000 guests. 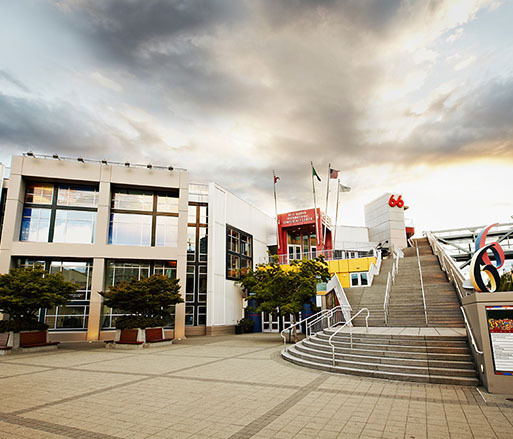 Large venues also include Bell Harbor International Conference Center, on the waterfront near the aquarium, with almost 100,000 square feet of space. The article "Bell Harbor, Seattle Hotels Team Up" discusses how Bell Harbor International Conference Center joined forces with The Edgewater Hotel and the Seattle Marriott Waterfront to create Destination Waterfront, a one-stop shopping resource for groups looking to book meeting space and hotel rooms in Seattle. Shelley Tomberg, Vice President of Sales for Columbia Hospitality, stated that "with the cooperation, Bell Harbor and the two hotels are much stronger together at attracting business than they would be on their own." SEATTLE- Bell Harbor International Conference Center has completed a one-year research study to calculate its carbon footprint, in an effort to become a more eco-friendly meeting and event destination. As a result, Bell Harbor is better prepared to work with groups to identify ways to reduce an event's carbon footprint and ultimately lessen its impact on the environment. "As Seattle's premier conference center, we are happy to be leading the charge in making greener meetings available to our guests," said Greg Werry, general manager of Bell Harbor International Conference Center. "Our waterfront location on the beautiful Puget Sound is a constant reminder that we need to do our part for the region and the world." "Bell Harbor International Conference Center has been a significant partner in helping the Port of Seattle to reduce the carbon footprint at Pier 66," said Dennis Scott, Port of Seattle facilities maintenance manager and supporter of the Bell Harbor carbon footprint research study. "The Bell Harbor team has reduced the venue's waste stream through increased food and material recycling and has been a major contributor in energy conservation efforts by reducing electricity, steam and water consumption." In December 2009, The International Association of Conference Centers (IACC) awarded Bell Harbor with Gold Tier status for the conference center's commitment to the IACC Code of Sustainability, an extensive outline of the most up-to-date environment practices relating to education and awareness, water and energy conservation, waste management, air quality and more. Bell Harbor, one of just two Washington State properties on the Gold Tier, qualifies for this distinction based on its commitment to the sustainability initiatives outlined in the code. Bell Harbor eliminates tons of food waste each day by donating leftover food to local food banks, maintaining composting program and recycling kitchen grease into bio-fuel that is used to power Port of Seattle vehicles. All food and beverages are served using reusable flatware, dishes, napkins and cups. In addition, the conference center serves fair trade coffee and uses locally grown food whenever possible. Its current recycling rate is 70 percent, well above the City of Seattle's goal of 60 percent. In April 2008, the venue earned a four-star rating from EnviroStars, a nationally recognized program that certifies businesses that reduce, recycle and properly manage hazardous waste. In an article about international clients, Bell Harbor Convention Center is mentioned for its simultaneous translation booths, technological capabilities, and "sophisticated amenities." Bell Harbor has seen a growth in international attendance as a recent conference at the center drew attendees from 93 countries. The center, operated by Columbia Hospitality, has all the conveniences to ensure comfort during meetings, including specialized cuisine. Described as one of the meeting industry's "best-kept secrets," Seattle is a city with unmatched beauty and value. 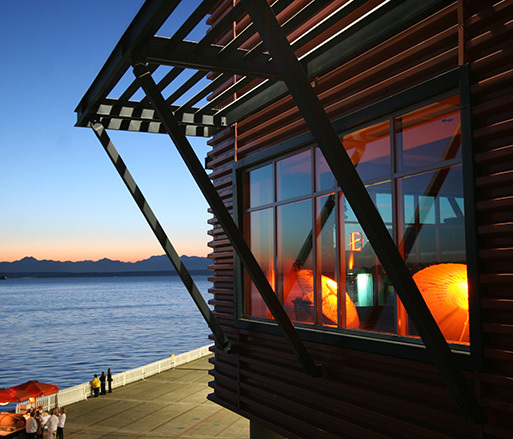 Located on Elliott Bay, Bell Harbor International Conference Center has 100,000 square feet of waterfront function space, including the Rooftop Plaza that has panoramic views of the city and the Olympic Mountains beyond. In the article "Conference Centers We Love," Bell Harbor International Conference Center was acknowledged for its multi-use space. 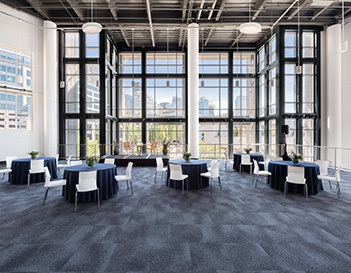 Offering 100,000 square feet of space, the facility provides a 300-seat auditorium with six simultaneous interpretation booths, a rooftop deck providing views of the Seattle skyline, and a prime waterfront location. 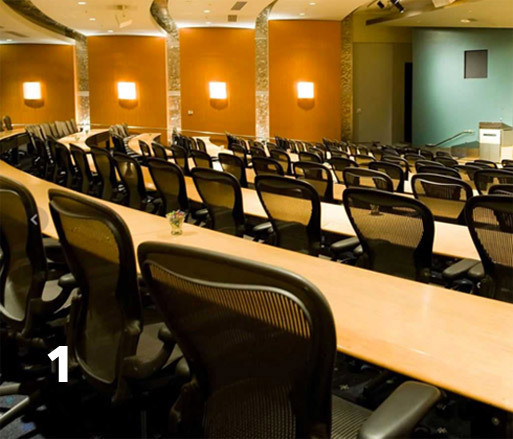 Bell Harbor International Conference Center is an ideal location for meetings, conferences, and events. Located at the water's edge, Bell Harbor is within walking distance of several major hotels and dozens of Seattle's best restaurants. The 2008 Professional Convention Managers Association annual meeting was a city-wide event held in Seattle, Washington. The four-day conference included seminars, receptions, and networking/social events for 3,400 top meeting planners and suppliers to the Northwest. Bell Harbor Internation Conference Center, a sponsor of the PCMA conference, hosted the event's networking reception.